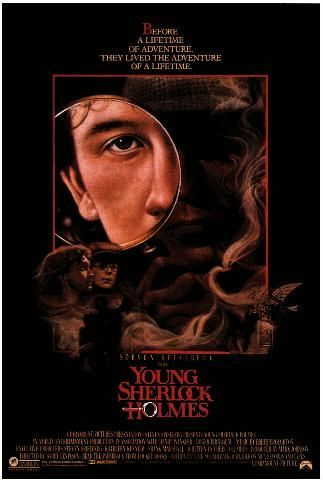 Young Sherlock Holmes. Amblin/Paramount 1985. The blurb isn’t much more helpful. It talks about an “exciting adventure” and a “series of mysterious deaths near… Brompton Academy.” That’s more than enough for me to get a sense of what to expect, actually, but it doesn’t give me much to say. I’ve heard it’s a comedy and that, by nature of its premise, isn’t even attempting to live up to canon. Side note: I wanted to have a Leslie Nielsen movie this week in light of his death, but was unable to obtain one. The one I chose should be here next week though. John Watson arrives at his new boarding school and immediately meets the brilliant yet arrogant Sherlock Holmes. He also meets Holmes’s girlfriend Elizabeth, rival Dudley, and Holmes’s good friend/ Elizabeth’s eccentric uncle Waxflatter. A series of unusual suicides has hit the area, and Holmes is convinced foul play is at work. After Dudley gets Holmes expelled, Waxflatter is the next suspicious death, and Holmes will stop at nothing to find who’s responsible. Of course, I can’t watch a Holmes adaptation without rating how they portray Holmes and Watson. Thankfully, Watson is not held to the Nigel Bruce-style blunderer, though he’s still given to being less smart to make Holmes look better. He also does silly and childish things, but that’s because he is a child. Holmes also escapes his caricatures, though I wonder how much of that is because this is something of an origin story. He’s still learning to be dispassionate, his deductive reasoning skills are still raw, and of course he’s still fairly capable with women. Still, I liked the performances well enough. Sometimes the Holmes-Watson-Elizabeth trio reminded me a little too much of the Harry Potter leads, but that is not the fault of this movie. Oh wait, I see Chris Columbus was one of the writers. That explains it. Though Stephen Spielberg is the executive producer, I was afraid from its appearance that this film would not have the “Spielberg touch.” I can’t quite describe what that is, but I still associate Spielberg with spectacle and heavy special effects (Although I am starting to come to see him more as a grand-scale storyteller than anything else). Surprisingly, there are indeed heavy special effects, mostly supplied by the hallucinations that bring on the suicides (Also, the flying machine the eccentric uncle builds which is practically labeled “Chekhov Artillery Factory”). I’m left lamenting that this is once again a “jazzed up” Holmes effort. This is a fun film that perhaps played a little too much to cliches without spending enough time on consistency (Dudley the Draco Malfoy prototype is massively important in act one, then it stops being a high school story and we never see him again). This is very respectful to established lore while bending it whenever they need to. It’s not afraid to be its own movie when it needs to, and admit it, which makes me appreciate it more than some lesser adaptations. Watch this movie: As a story of plucky kids doing adults’ jobs. Don’t watch this movie: For a great literary mystery.